There are many styles of Filipino martial arts, running the gamut from spears and swords, all the way to grappling and empty hand techniques. The differences lie on the emphasis of techniques. These differences are usually apparent from region to region, but more often than not, styles can evolve among different instructors depending on their personal interpretation of the art, even among those who studied under the same master. This is not necessarily a bad thing because it shows that the art is adaptive and vibrant, but it can make identifying a style particularly confusing. 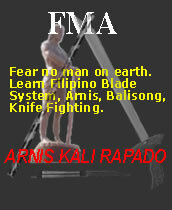 Right now, I'm going to focus on one particular style called Arnis Rapado, developed by Master Limuel "Maning" Bonsa. Master Bonsa was born in Albay in the Bicol region. He studied under several arnis masters in Bicol before moving to Manila in 1974, hence Arnis Rapado is heavily influenced by Bicol arnis. Aside from teaching, Master Bonsa expanded his repertoire by studying other arnis styles under several grandmasters like Remy Presas (modern arnis), Jose Mena (Arnis Doblete Rapilon and Arka) and Antonio "Tatang" Ilustrisimo (Kali Ilustrisimo). All in all, Master Bonsa has more than 30 solid years of experience in the martial arts. These are experiences gained not only in the training hall, but in the street as well. In the provinces, it is not uncommon that when one is learned in arnis, one would receive challenges from gangs (either singly or as one whole group) or from other arnisadors. Master Bonsa did not limit himself to just arnis, but has also mastered Karate, Kung Fu and Tai Chi Chuan. All of his experiences were distilled into his expression of the art, called Arnis Rapado. Arnis Rapado is more of traditional, as opposed to tournament arnis. Techniques are simple and direct to the point, emphasizing the quickest and most efficient way to defend oneself, because what may work in the tournament does not necessarily translate into the street. Like other styles, Arnis Rapado teaches students to use one or two sticks for self defense. However, Arnis Rapado emphasizes ambidextrous familiarity with each technique, meaning a practitioner should be able to execute a particular technique either with the left or the right hand. Master Bonsa says this is important because one never knows if one will need to use the "off hand" in a fight. It will also help to mentally prepare the student to face any opponent regardless of whether the opponent is left-handed or right-handed. Like other styles of traditional arnis, Arnis Rapado also teaches blade work, such as single sword, sword and dagger, and single dagger techniques. All in all, Arnis Rapado contributes to the wealth of Filipino martial arts available to us by preserving the original intent of the art while introducing innovations that train the student to handle different self-defense situations.